I have read a lot of books in my life, I like to think of myself as a reader, I like to read a lot of books. This book is one of the top 5 books I have ever read, I read it in several hours, I neglected my house, laundry and everything else, when i started it there was no stopping me.. 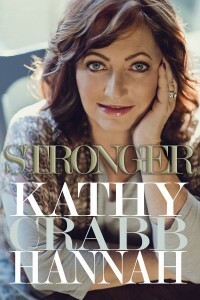 In this book Kathy shares her heart, it is more then someone sharing her heart, she is encouraging women and men to continue going when times are tough because it will make you stronger. Sh has inspired me to be more positive, to smile more, eat more cake, be with family and love Jesus. She shares the scary times of her life going thru divorce, heart surgery, The happy time when she was taking care of her kids after their bus wreck, the fun stories from her grand kids and when shemarried her Steve. She will have you laughing and crying oat the same time, I don’t think iI could have remained as positive as she has in this book. She has gone thru a hard time in her life, she shares so much with us. She also had me craving cake, she thinks every day is a good day for cake and I agree with her, cake can fix anything. You may have heard of her singing family- The Crabb family- they are my absolute favourite in christian music. I am in love with this family and after reading this, I am more in love with them and their beautiful attitudes after all they have dealt with and gone thru.